Debbie Ocean has a master plan to rob the Met Gala, but she’ll need to assemble a crew of professionals to pull off the job. 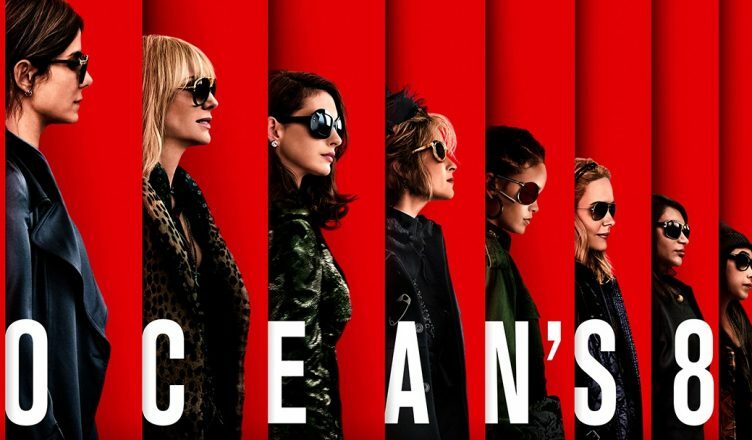 Ocean’s 8 stars a wonderful cast of Sandra Bullock, Cate Blanchett, Anne Hathaway, and more. The great ensemble of a cast is one of the better standouts for this film. Sandra Bullock is equally as charming and devious as her character’s brother (“Danny Ocean” played by George Clooney”). One thing that was appreciated was that Bullock’s character was given just enough depth to fulfil our curiosity. That is to say, the film didn’t make her background a long drawn out process. Next to Bullock, the supporting cast really helped the movie flow at a smooth pace. Probably one of the better performances in the film may come from Anne Hathaway’s character, “Daphne Kluger”. It was nice to see her display a bit of a range even though this movie doesn’t call for the deepest levels of acting. If you’re familiar with the previous Ocean movies starring George Clooney, then you’ll be pleased that this film mimics a very similar plot structure. You get the same twists and turns in the film that ideally formulate a typical heist movie. One thing that’ll pique interests are the unique challenges to the heist that the group has to encounter. In addition to that, a few familiar faces and cameos are nice crowd pleasers sprinkled throughout the movie. While this heist film did bring about some new and unique challenges, they never appeared to be that challenging. One of the biggest issues with Ocean’s 8 is that the risks are minimal and you rarely feel as though the group is in actual danger. There are just one too many convenient situations for the characters in this film. Just say good bye to any sense of suspense during the climax of the film. Not only that, but because this movie doesn’t take many risks. So much so that one of the supposed twists in the movie is predictable early on. The particular twist I’m referring to was just a missed opportunity to have a part of the story be more engaging, but I think the writing fell short. The constant foreshadowing of Bullock’s character’s plan was just a bit overkill. This unfortunately leads to a rather anticlimactic resolution for a big part of the story. Ocean’s 8 is an entertaining movie at the end of the day. You’ll get some laughs, and see some cool stuff happen on screen. You’ll also really enjoy the characters. However, it doesn’t really live up to any of the previous Ocean’s movies with George Clooney. Ocean’s 8 simply feels a little too cookie-cutter. I can’t speak to whether or not this movie successfully amplifies any type of feminists ideals. Although, I can say that I did appreciate what this movie attempted to do with its all female cast. 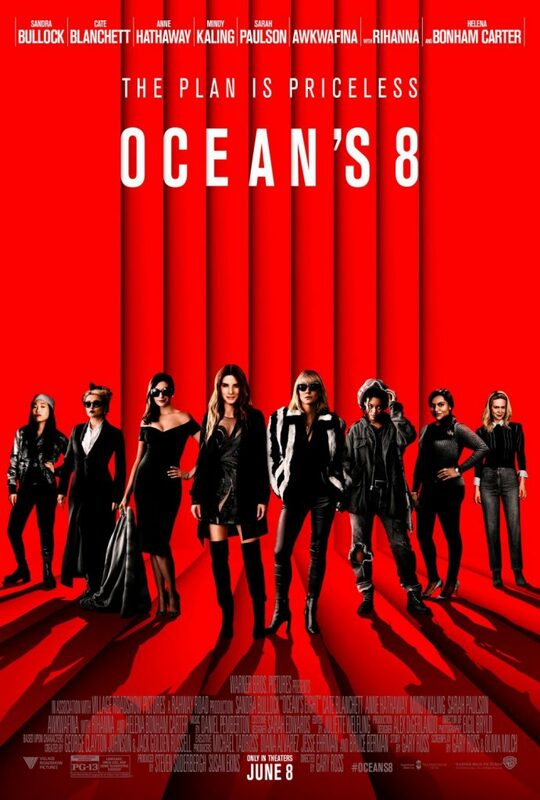 Feel free to check out Ocean’s 8 in theaters, but I’d go in with lower expectations if you’re seeking a knockout hit. Ocean’s 8 is in theaters now. Be sure to follow E-Man’s Movie Reviews on Facebook, Subscribe on YouTube, or follow me on Twitter/IG @EmansReviews for even more movie news and reviews!